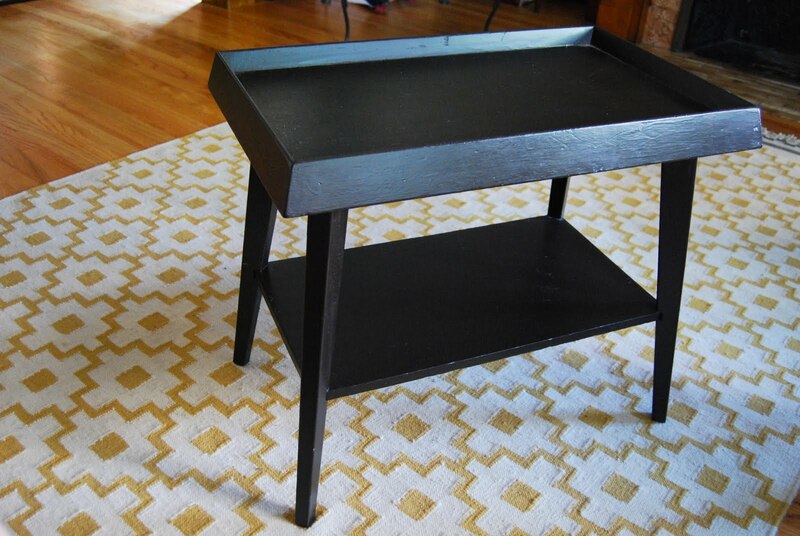 There are a lot of incredible furniture before and afters on the web. I think renovation before and afters are the internets very own crack cocaine. 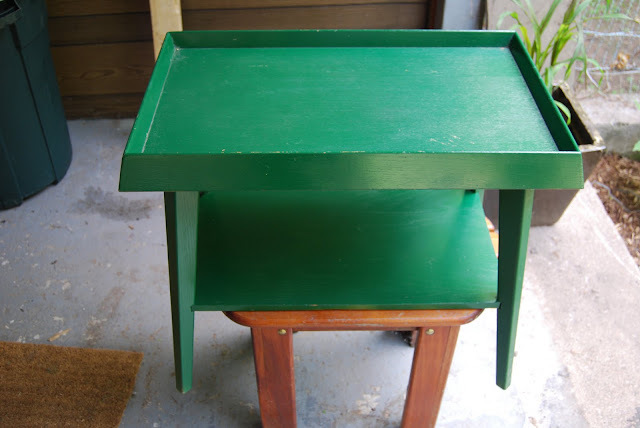 We really need some side tables, and I found the Christmas tree green one below at an antique store. I paid $15. 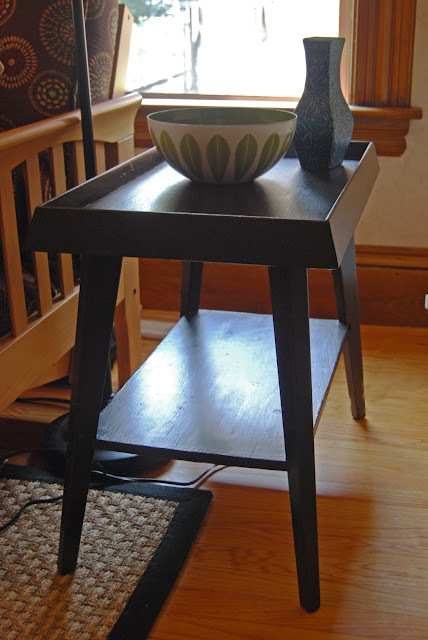 I liked the height, angled surfaces and proportions, but the color was awful. The table is nothing fancy. It's poorly put together and made out of soft pine, so I didn't feel bad about spiffing it up. I stopped by Clark Paint - our newest sponsor - for a little advice. I wanted a shiny surface in a color I described as "Brown that's almost black". 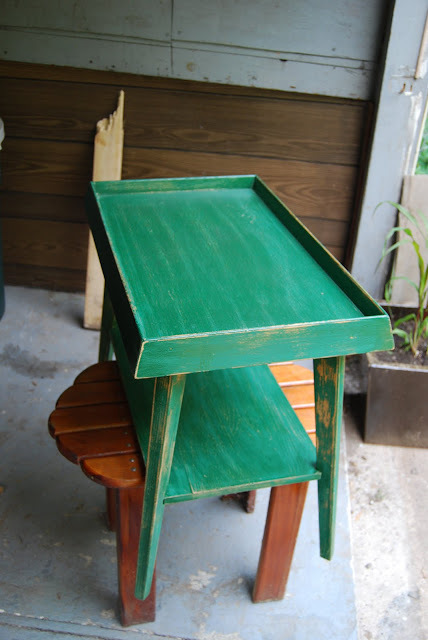 Since the table will get a lot of use, Clark recommended oil -based paint for its durability. They mixed me up a quart. This is the first time I've used oil based paint. It's application is so forgiving as compared to acrylic paint! I caught drips and smoothed out brush strokes easily that would have already dried to sticky blobs with acrylic paint. Of course, oil paint smells more toxic than a seventeen year old girl's perfume, but hey. Then, using 180 grit sandpaper, I roughed up the surface evenly and used a tack cloth to remove ALL specks of dust and paint debris. Here is is after a couple weeks of curing. Great job on the table. That came out really nice. I wish I was that crafty lol. Stopping by from SITS 31 DBBB challenge. Hope you have an awesome day. LOVING it. Amazing what a new paint color can do. This looks great. I laughed at your opening paragraph because it is SO true. I can never ever get enough of online DIY before and afters. The new look is great. That green? Eek! What was the prior owner thinking? I love the result of that old table it beautiful, and the way you stage it, makes me want to go out and find an old table and redo it. LOVE IT! Clark Paint has been around since 1929. They have the 'know how' and savvy and is the best place for paint for miles around.